Up to this point, it's been pretty simple woodworking. The legs start to get a little more complicated, using some simple joinery. Once again, the materials and construction are crude enough that you don't need to obsess about perfection. But this is a good opportunity to develop your skills. The bench will survive a few mistakes. 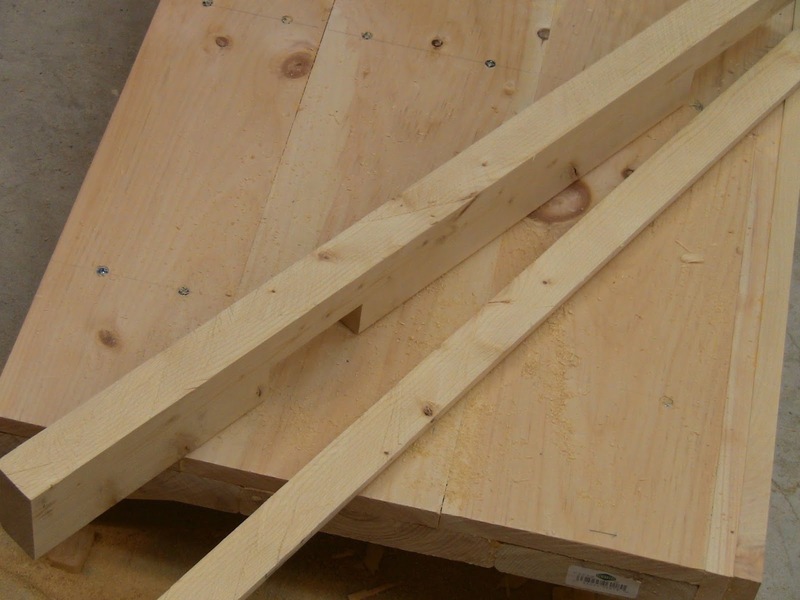 To build the legs, the left pair first needs to be evened up with the right pair. The dimensions in the cutlist get you close, but now you need to exactly match them to the spacer stock you have. 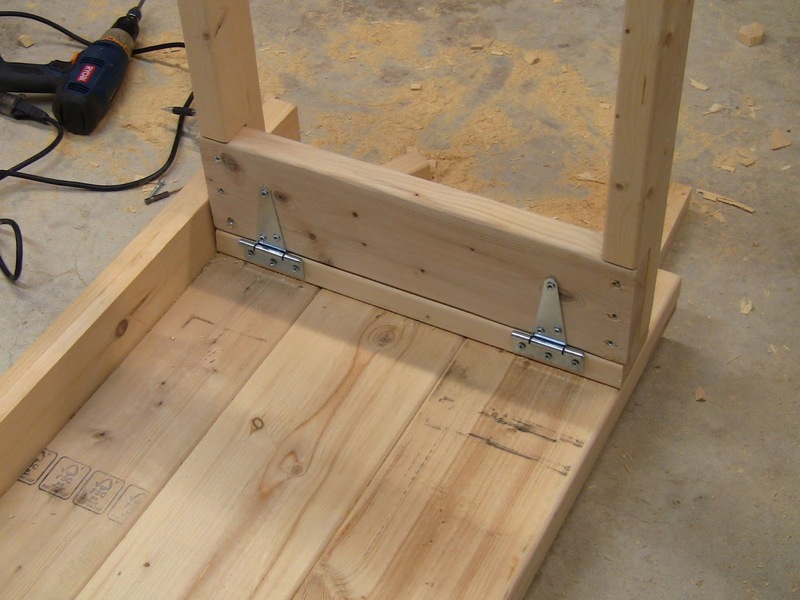 Stack two spacers on the floor and stand one of the shorter left legs on them. Stand one of the longer right legs on the floor up against it. 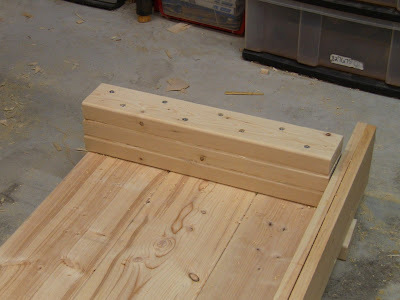 Either the right or the left leg will be slightly longer (unless they match to within the thickness of a saw cut or so, in which case it's good enough and you can skip this part). Mark the shorter length on whichever piece is longer. Form a knifewall at this mark and carefully saw the longer piece to length. 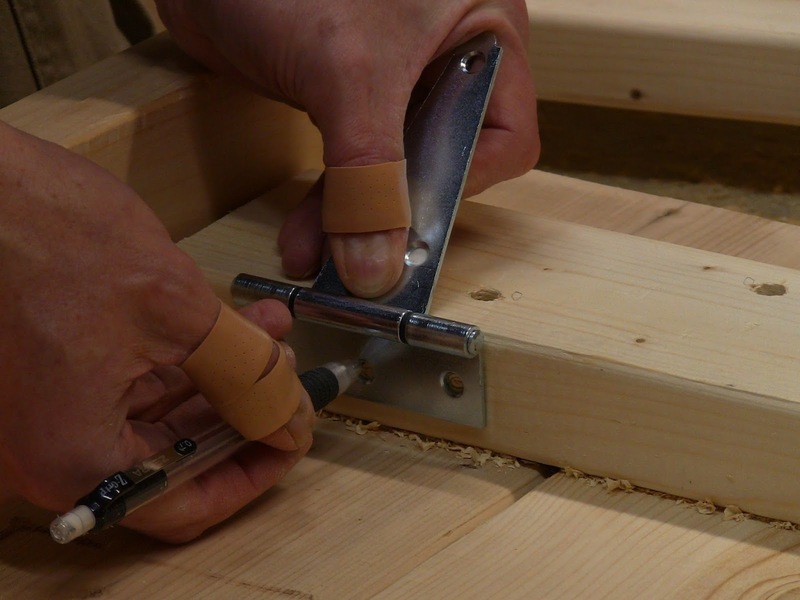 When sawing really thin amounts, it helps to put your hand on the outside to support the flimsy bit of wood to keep it from breaking apart. One strategy you can use when you need to match parts like this is to deliberately leave the second part a little long, by 1/4" to 1/2". That leaves enough wood that it's easy to saw off without breaking apart. Mark the shorter piece on the longer one. This one needs about 1/8" removed, so it's enough to worry about. After forming a knifewall at the mark, carefully saw off the small bit of waste. You can see that these tools allow you to remove small pieces. The legs are joined to the stretchers with simple lap joints. Each pair of legs has to have laps cut to match as closely as possible. The way to do this is by ganging the pieces. Might as well gang up the other pair of legs at the same time. You get the best fit by marking directly from the parts you have. Don't worry about numbers, use actual sizes taken directly from the parts. Use the kerf-and-chisel method to remove the waste, where you make a series of closely-spaced saw cuts to weaken the wood, then chisel out the chunks. Gang all the legs even at one end and clamp them together. This will be the bottom. Set the combination square to 8". Mark this point up from the bottom. Square across the ganged parts at this mark. 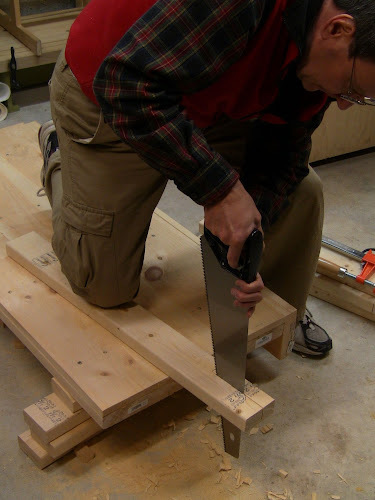 Stand the end of a lower stretcher at the mark and mark its upper side, establishing the width of the lap. Square across at this mark. 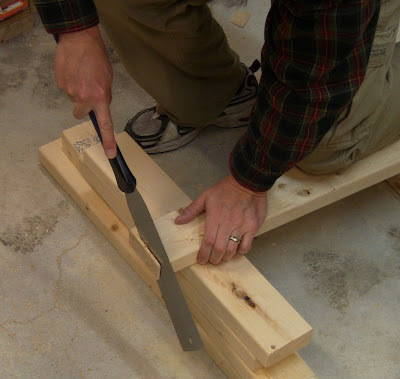 Set the square to the thickness of the stretcher. Square down the sides of the gang at the lines, then use the square as a gauge to run a line along the side between these lines, establishing the depth of the lap. Form knifewalls across the gang at the upper and lower lines, scoring out the troughs on the inside, in the waste. Saw carefully across the gang in each knifewall. The two main things to pay attention to are that the cut goes straight down, not tilted at an angle, and you don't saw past the depth line. Make several more relief cuts across the gang in between the two end cuts. These don't have to be exact, just avoid sawing past the depth line. Unclamp the gang and mark depth lines on all the pieces. With the legs ganged up flush, mark 8" up from the bottom and square a line across them. Mark the width of the lower stretcher from this line and square another line across. 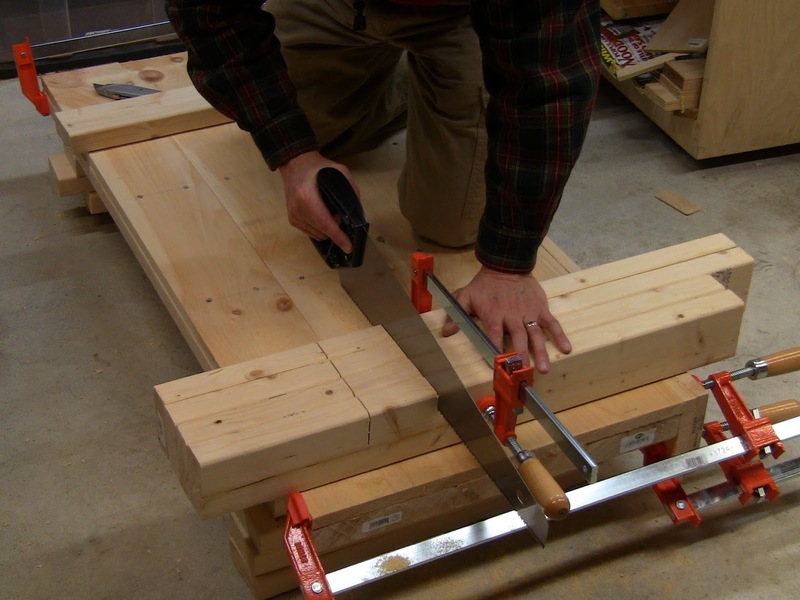 Set the square to the thickness of the stretcher. Square lines down the sides of the gang and use the square as a gauge to mark the depth line between them. Form knifewalls at each line across the gang, and saw down carefully to the depth line. Look at both the near side and far side as you cut to make sure you don't go past the line. Saw several more random relief cuts down to the depth line. 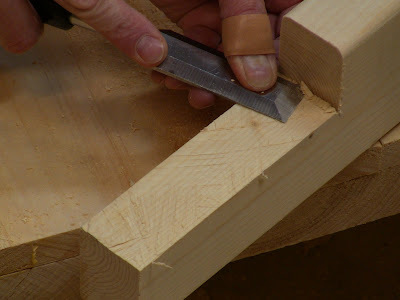 To chisel out the waste on each piece, do it as several steps, each getting closer to the depth line. That way you see what the grain is doing and avoid having it go deep on you and removing too much. 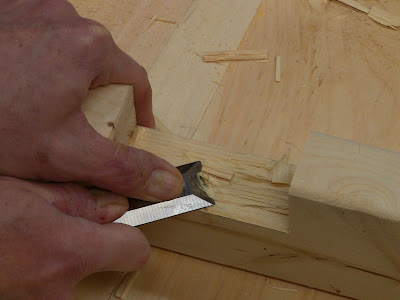 Using a large chisel, chisel down from the side, halfway down the depth. The kerfed wood should break out easily. Chisel halfway down the remaining depth. 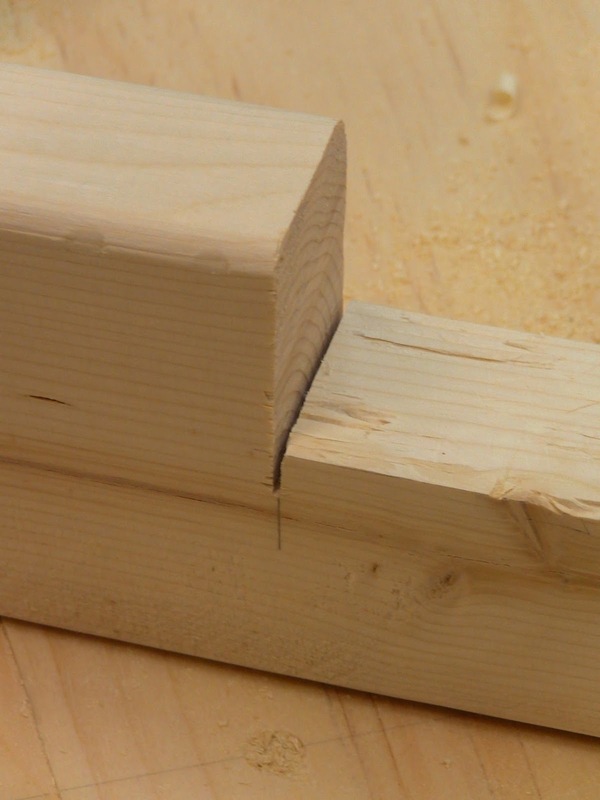 If the grain is not being cooperative, split the remaining distance in half one more time and chisel down. Now chisel at the line. Go in halfway from each side of the piece, don't go all the way through. This is where you want to be precise. Stand the piece on its back edge and pare with the end of the chisel to flatten out the bottom of the lap one shaving at a time. This is very fine work. Pay attention to the grain direction and pare with it. 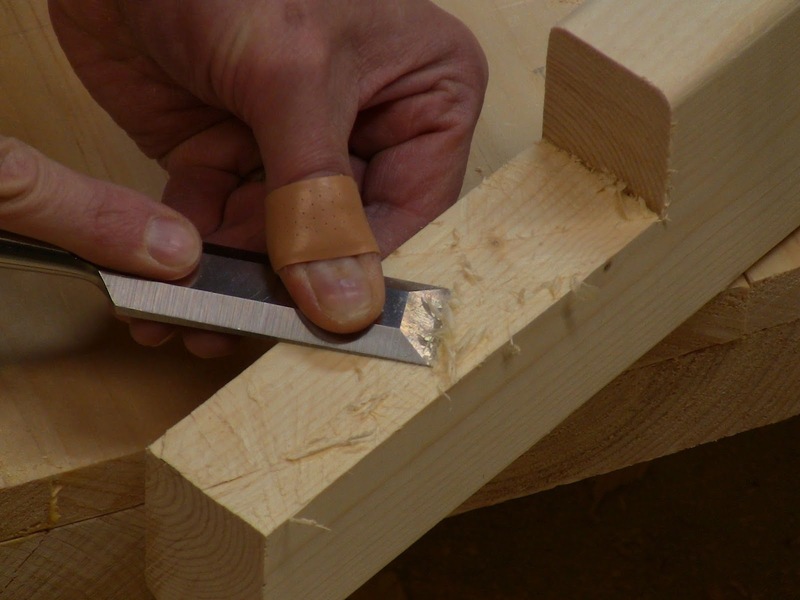 If the chisel is diving under the grain, you're going against it, so pare in the other direction. You can also pare at a diagonal or straight across the grain. This grade of lumber has frequent grain changes, so you may have to switch back and forth. 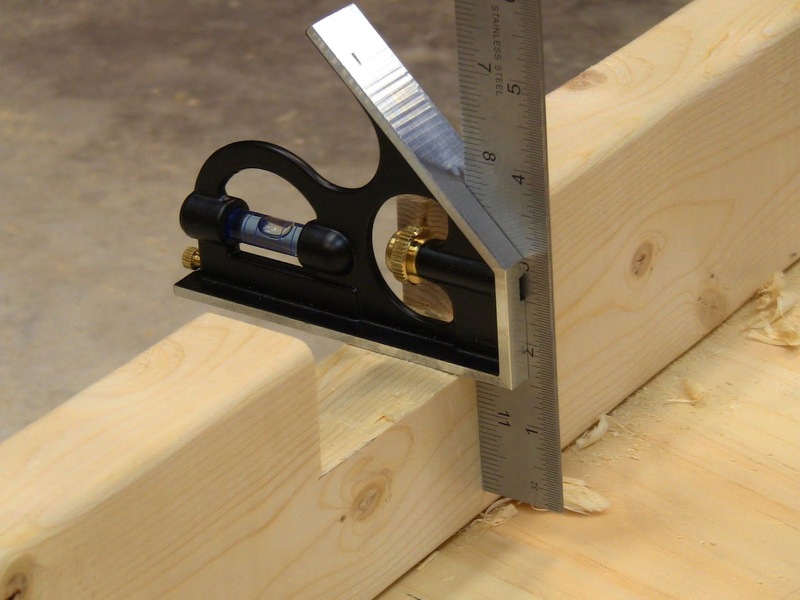 Use the combination square to check for any high spots that need to be removed. A very important concept to note here is the progression of chiseling from coarse, to medium, to fine work. The coarse work hogs off big chunks without being pretty. The medium work starts to remove smaller chunks with more care. The fine work removes very small amounts very precisely. You'll see this theme crop up repeatedly in woodworking. Coarse work is fast, removing material quickly. Fine work removes material slowly as you home in on exact dimensions. Get as much work done as you can at the coarse and medium stages to minimize the amount you have to do at the fine stage. 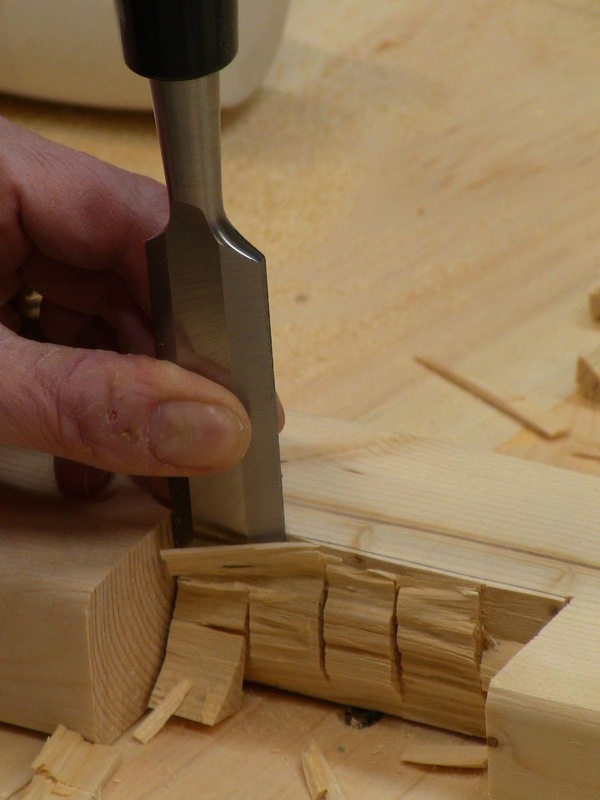 After two passes hogging off big chunks with the chisel, make another pass with smaller chunks. Working from both side into the middle, chisel down the last remaining bit exactly at the line. Pare the bottom carefully to remove any humps or uneven spots. Note the grip choked up on the end of the chisel, with the thumb pushing down and forward. 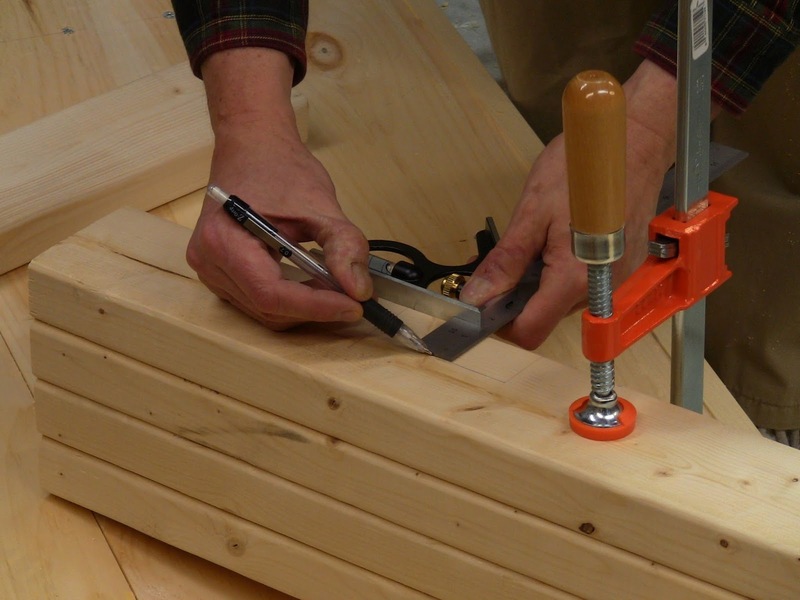 Handling the chisel this way gives control and limits how far it can go if it slips. 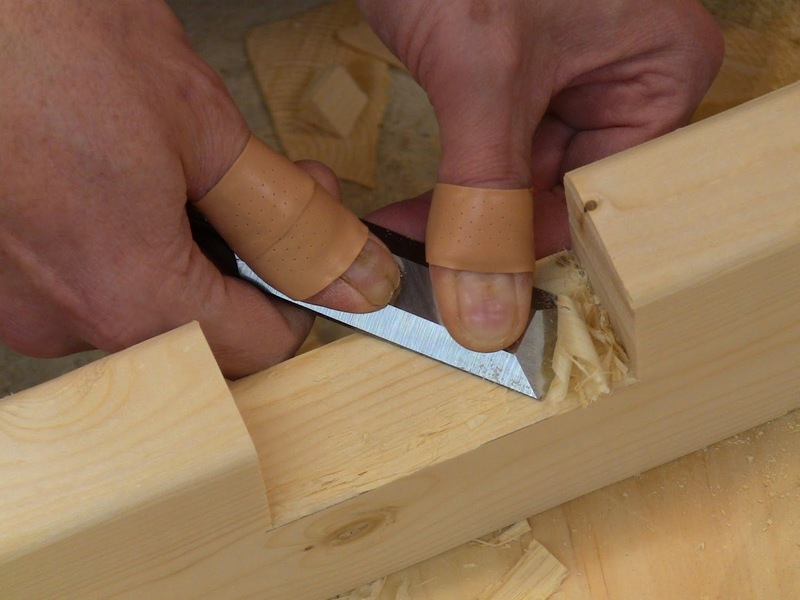 Pare the final shavings by sliding the chisel in a diagonal skewing motion while pivoting under the thumb. The thumb is doing most of the driving as well as holding it down flat. Check the bottom of the lap repeatedly for square, all along its length. Remember I said not to saw down past the depth line? This is what happens when you don't watch the far side of the cut closely enough. This looks bad and weakens the piece. The lap for the upper stretchers is similar, but top corner is notched off the legs. So you rip down instead of chiseling out. Clamp the legs ganged together at the top end. 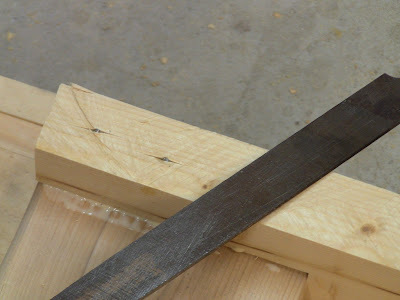 Mark down the sides with the square, still left at the stretcher thickness. 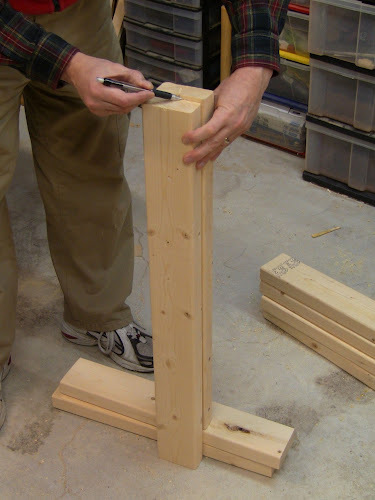 Set the square to the exact width of the upper stretchers and mark that length from the top end, then square across. Form a knifewall and saw down the gang to the depth of the notch. 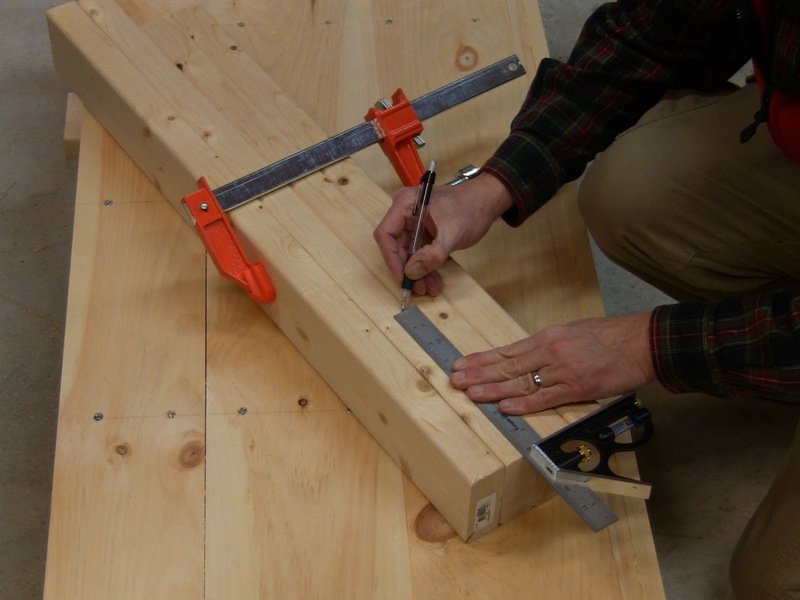 Unclamp the legs and mark down all the unmarked leg sides for the stretcher thickness. You'll need to reset the square to this thickness. 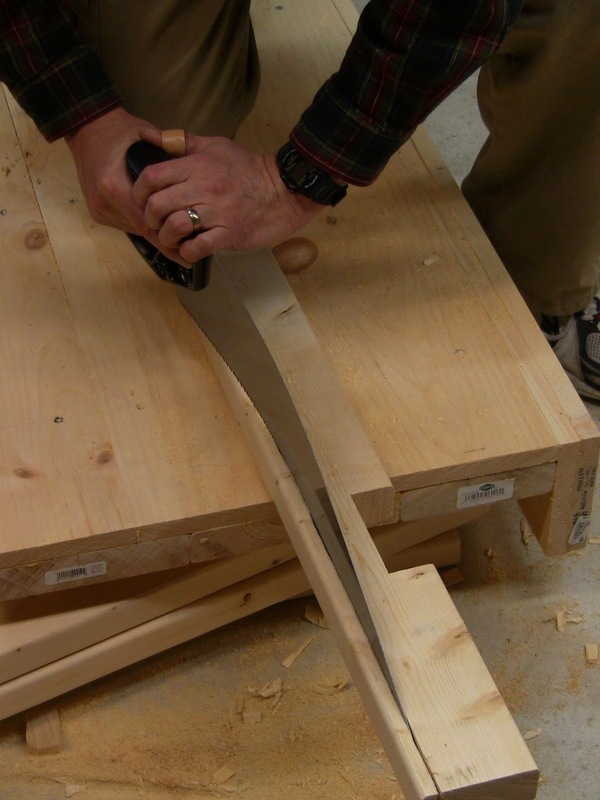 For each leg, rip down the length of the notch, cutting just to the waste side of the line. Flip the piece several times as you rip to keep to the line. 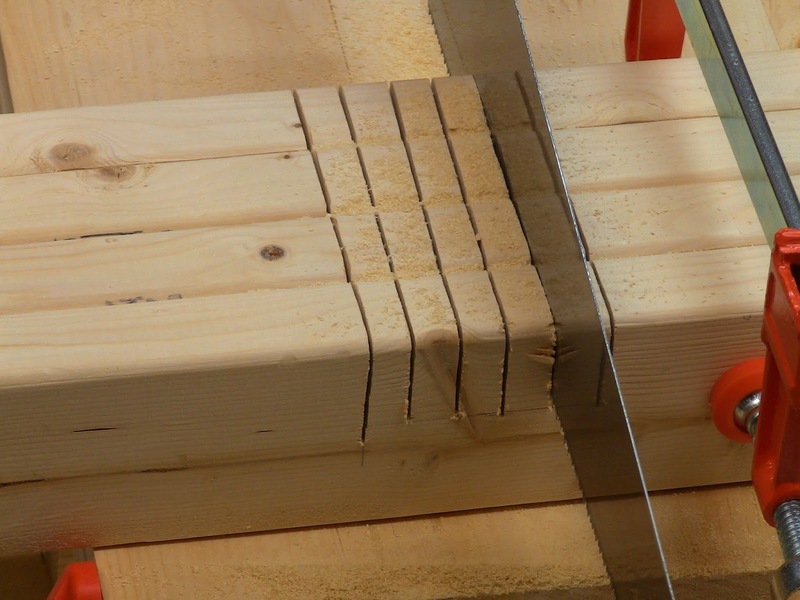 As you reach the end of the cut, bring the saw up to 90 degrees so the cut ends square across the thickness. Chisel the notch smooth down to the line. With the legs ganged together at the top end, saw across them at the width of the upper stretcher. Rip down each piece at the thickness of the stretcher, flipping the piece every inch or so to stay on track. Finish up with the saw at 90 degrees to meet up with the first cut. There's often some cruft in the corner. Clean it up with the chisel. Pare the surface of the notch smooth and square. Here we get to a slightly more challenging operation. The longer right legs need to be ripped down from 3 1/2" width to just under 3", so that the left legs fold down flat with them. The challenge here is getting a straight long rip. It's not really that difficult, but people find long rips intimidating. They think they can't keep straight on the line. The trick is to steer the saw continuously as you work, just like steering a car. 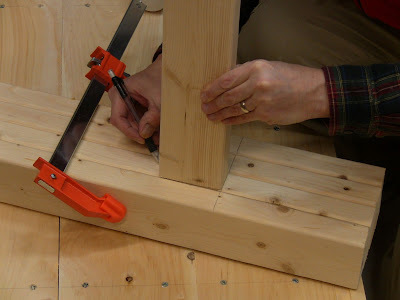 Use the flex of the saw to pull it right or left to keep it on the line. Meanwhile, flip the piece over every few inches. That keeps things under control. Don't worry if the results are a little rough. 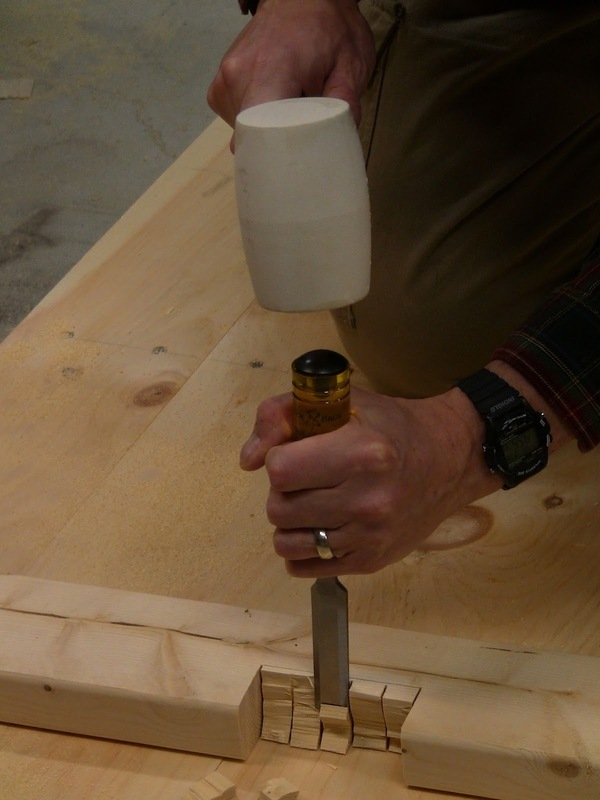 Later on when you develop hand plane skills, you can plane this surface smooth in a few seconds. I left the left legs at full width, but you can repeat this procedure on them for consistency if you want. Set the square to 2 15/16", which is one division less than 3". 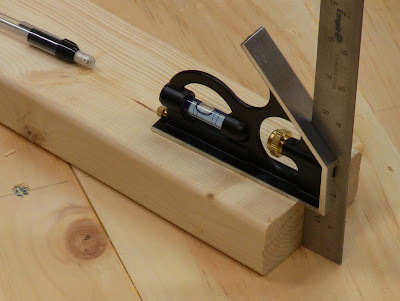 Use it as a gauge to mark down the width of each right leg on both sides. With the end hanging off the edge of the bench top, kneel on the piece and start the cut, just to the waste side of the line. Make sure to have the saw square. 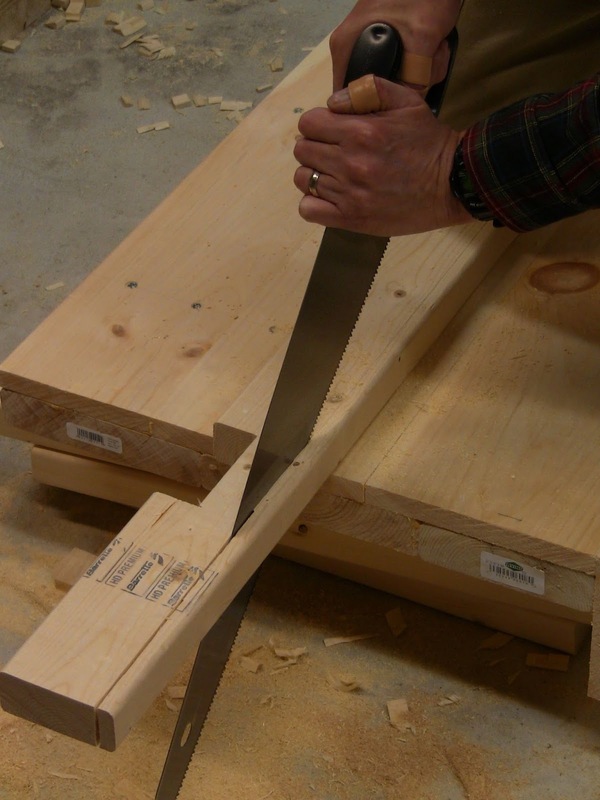 Once the cut is started, flip the piece and start again from the other side. Repeatedly saw a few inches and flip the piece to the other side, until you get past half the length of the leg. 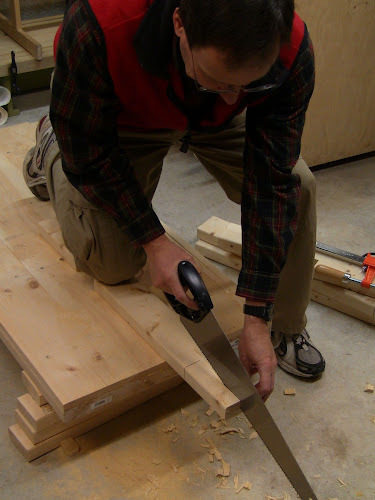 Remember to steer the saw as you cut to keep the cut straight. Your goal is to just leave the pencil line. Reverse the leg end for end and repeat steps 3-5 on the other end, until the two cuts meet in the middle. Repeat steps 3-6 on the other right leg. If you end up with any really ugly humps in the rip due to steering corrections, you can pare them down flat with the chisel. Rip down the length of the leg just to the waste side of the line, flipping it every few inches. 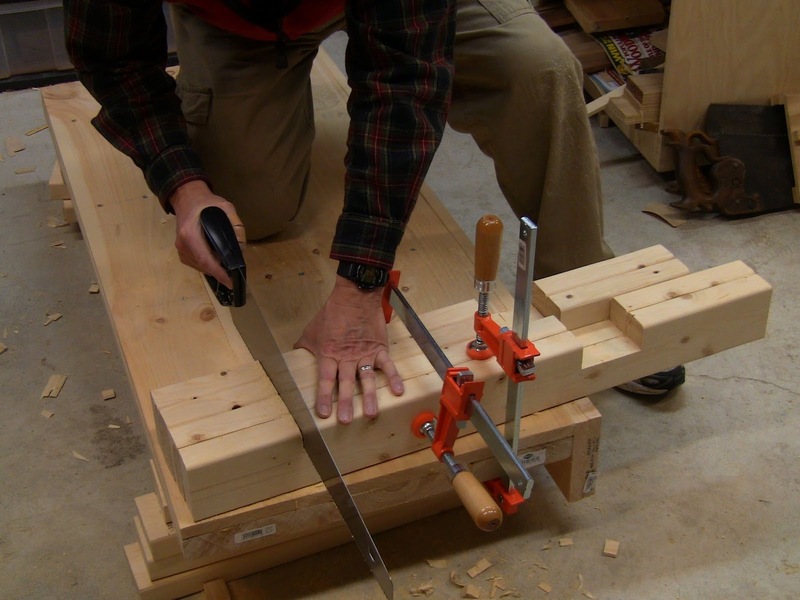 Steer the saw by dropping it to a low angle and flexing it back toward where it needs to be. I've exaggerated the flex here; usually it only takes a small amount if you don't let it get out of control. 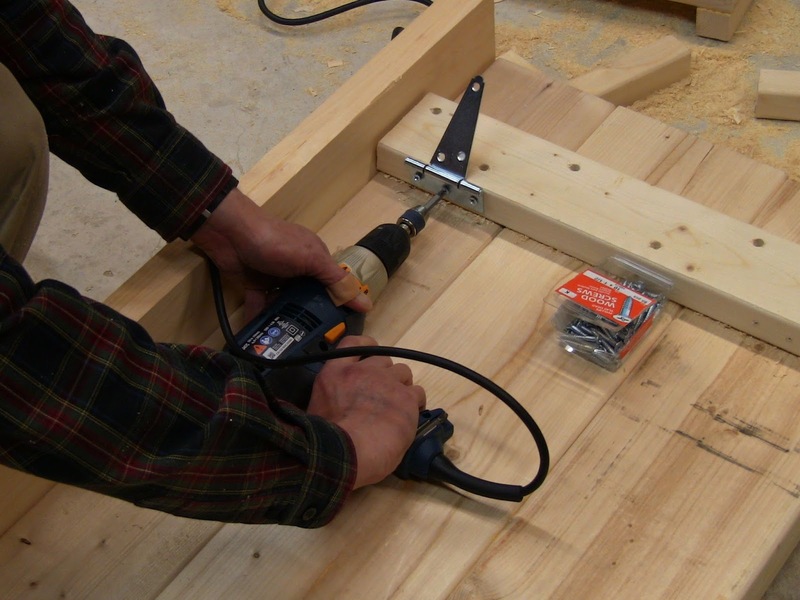 Lay the right legs on the bench top and spread glue in the laps. 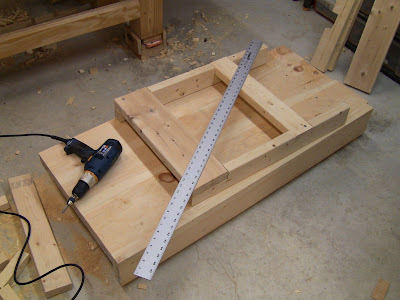 Set an upper and lower stretcher in place, with the ends flush with the leg sides. Counterbore for 3 screws in each upper stretcher end, and 2 in each lower stretcher end. Drill one pilot hole in the left end of the lower stretcher, and one in the right end of the upper stretcher. Drive #12x2 1/2" screws in them. Square up the assembly by measuring with your straightedge diagonally from one corner to the other, then repeating for the other diagonal. Push slightly on the longer diagonal to squish it down. That will also lengthen the short diagonal, so split the difference. Make sure the stretcher ends remain flush with the leg sides. Repeat this as necessary until you get matching diagonals. 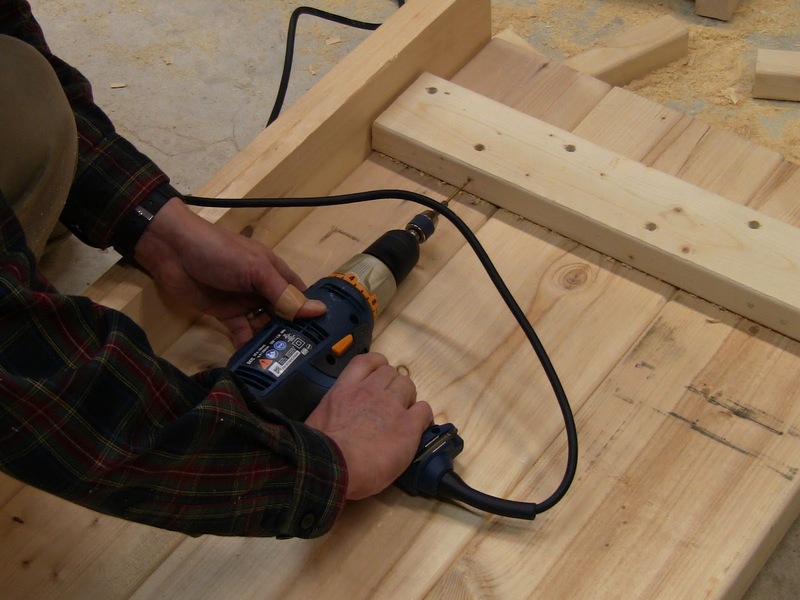 Drill the remaining pilot holes and drive screws, being careful not to shift things around. Repeat steps 1-6 for the left legs. If you've left them at their original 3 1/2" width, you can use #12x3" screws. Square up the assembly by measuring the diagonals and adjusting until they match. Oops! I used 3" screws on the right legs, so the points came through. I filed them down flat. Spread glue on the left spacer and lay another spacer on top. Counterbore and drill pilot holes in a zigzag pattern along the length of the spacer, alternating the zigzag from the lower spacer. Drive #12x3" screws in the pilot holes. Repeat steps 1-3 for the last spacer. The stack of spacers for the left legs glued and screwed in place. Position a hinge over the right spacer 1" from the end, opened partially back so it rests straight and the barrel is centered on the top edge of the spacer. The main challenge in installing hinges is making sure their barrels are aligned. If they don't line up, the hinges will bind. Mark the location of the screw holes. Drill 7/64" pilot holes and drive #10x1 1/2" screws. Repeat steps 1-3 with the other hinge. 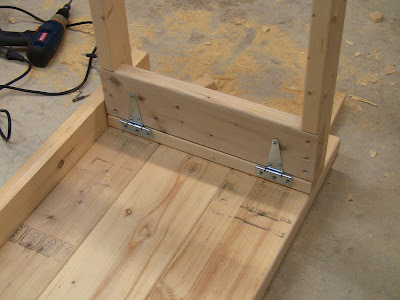 Stand the right legs up on the spacer and position them flush with the end and side of the spacer, with the upper stretcher against the hinges. Make sure you have the long legs for the end with the single spacer. 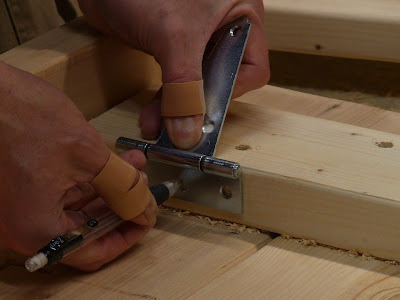 Flip a hinge up and mark the holes. Drill and drive the screws. Repeat steps 6 and 7 for the other hinge. Repeat steps 1-8 for the left legs. 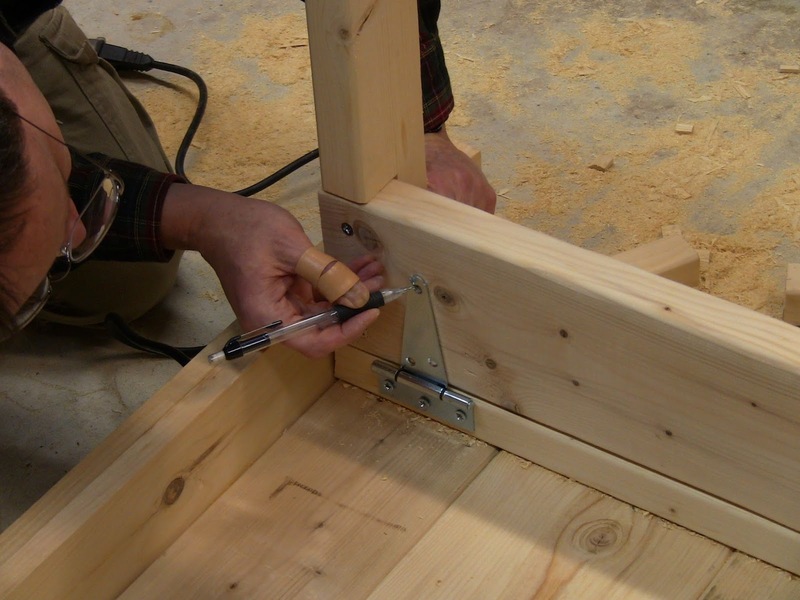 With the hinge partially opened to rest with the barrel centered on the edge of the spacer, mark the screw holes. Screw the hinge into place. Mark the screw holes on the upper stretcher. The right legs secured to the bench. In part 4, we'll add the cross-braces and do some final trimming. Simple and useful for the small shop minded. Looking forward to part 4. By the looks of the pics you may want to consider gloves for the sake of your thumbs! Simple and practical. How do you do it that you work so snap your picture? Thanks! I have the camera mounted on a tripod and use the built-in self-timer, then check the picture it on the camera display. Sometimes it takes a few shots to get it right.